The Swiss “St. 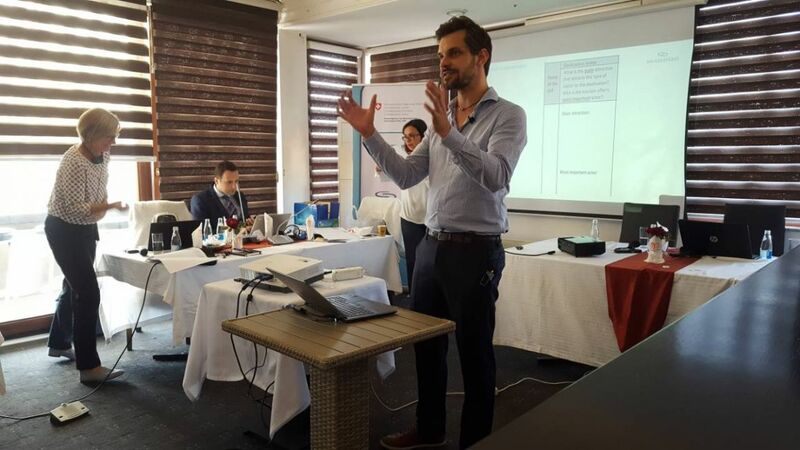 Gallen” destination management model of tourism strategy development and how it can be applied in the context of making the city of Prizren, south Kosovo, a more attractive tourism destination was the essence of a workshop organized on 16 October 2018. The workshop, organized jointly by the Municipality of Prizren and Swisscontact’s Promoting Private Sector Employment project, was facilitated by Gabriela Crescini and Chritian Pallmer, two tourism experts from Swisscontact head office. The workshop brought together some 40 professionals of diverse backgrounds to brainstorm on how to harness the potential of Prizren for developing tourism further. Participants represented hotels, cultural organizations, museums, city and mountain guides, extreme sports trade associations, craftsmen, tourism and transport agencies, as well as municipal and central institutions. They all contributed to identifying the flow of tourists in the city and how to put Prizren more prominently on the map. “Tourism development is a great opportunity for the development of our municipality, and we must use it. By the end of the year will have the tourism development plant, and the solution to increase the touristic capacities in order to increase the length of stay of existing tourists and the number of tourists to our city,” said Mytaher Haskuka, Mayor of Prizren.